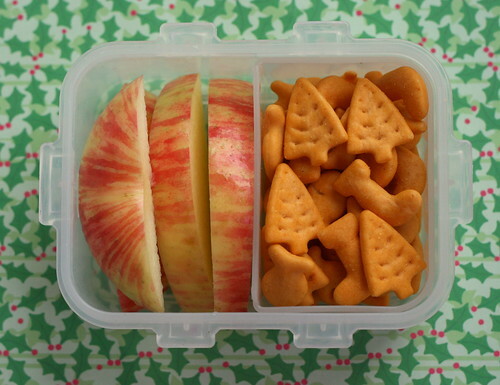 another lunch: Lock & Lock bento lunch and snack: it's beginning to look a lot like Christmas! 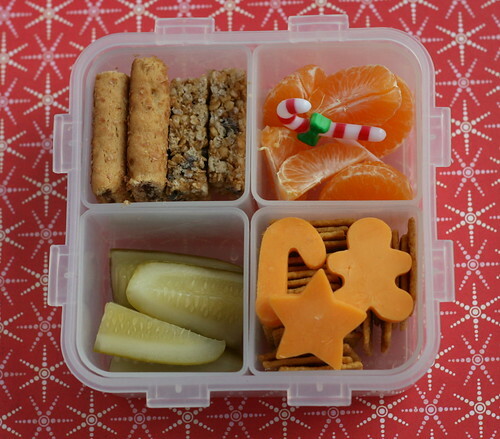 Lock & Lock bento lunch and snack: it's beginning to look a lot like Christmas! Pressing upward and onwards with the Christmassy spirit. 'Tis the season! He has Honeycrisp apple slices and holiday Goldfish crackers. We usually buy our fishies at Costco, but when I saw this holiday themed box at the grocery store I had to have it. :) Besides the usual fishie shapes there are also Christmas stocking and tree shapes. Fun! His lunch is also packed in a Lock & Lock box, the "4 square" version we are so fond of. - Trader Joe's strawberry cereal bar and a granola bar, both cut in half so they will fit in the small box. Oh those fishies are too cute! I am going to have to keep an eye out for them! Love the holiday themed fishies :-) The candy-can pick too... I'm sure it made for a big smile at lunch time! I'm so in love with the square box. I search the web for it every few weeks. Would you mind telling me how wide it is. I found one that 6" wide, but I swear yours looks smaller.